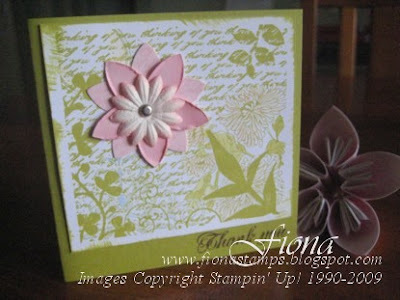 At last I'm able to show you some of my recent projects, using stamps and new colours from the new 2009-2010 Stampin' Up! catalogue (check the sidebar to view it online!). I made them a few weeks ago but I've just been too busy to photograph them. These two cards were created with the Fresh Cuts set, which comes with coordinating die-cut paper - the flower is already cut out! This makes it super-easy to create an elegant card in minutes. For this card I cut a piece of Kiwi Kiss (an In Color this year) slightly smaller than the white die-cut card, and stamped the background on that. I punched out a 5-Petal flower in Pirouette Pink and attached it behind the cut-out, using a brad. I stamped using Pirouette Pink and Chocolate Chip on the front of the card, and tied it all together with Chocolate Chip Taffeta ribbon. 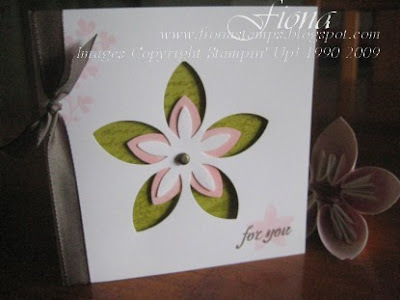 For the second card I stamped onto Whisper White, with Kiwi Kiss ink. I rubbed Kiwi Kiss around the edge before mounted it on Kiwi Kiss card. Using the Aquabrush and some ink from the inkpads I highlighted a few of the flowers on the design. I punched two 5-Petal flowers in Pirouette Pink, and daubed one of them with Pirouette Pink ink, and then roughed the edges. I used a little daisy from my stash, but you could colour a flower from the Pretties kit if you wanted to, and joined all the flowers together with a brad. Greeting is stamped with Chocolate Chip. I love this combination of colours together, and that I could achieve two quite different looks using the same products. I'm hoping to run some classes using this set next term. Hope you can come!